Roy Nakashima holds his Survival Pack. On a dark and stormy night far from home, a care package filled with the tastes of a sunny place can be the warmest of holiday greetings. If your gift list includes friends and family on the mainland -- or beyond -- a box of munchies can be the tastiest solution. Chocolate-covered macadamia nuts are fine, but there's so much more out there. We've narrowed the field a bit with these suggestions. All are relatively new, so they'll be fresh ideas to recent expatriates. Also, they're all made-on-Oahu, making them good omiyage for carting to the neighbor islands. Remember: The mailing deadline to the mainland is Dec. 17; after that you'll have to pay for priority mail. CURDS, NO WHEY: Donna and Randy Nakamoto work on their Planted by the River fruit curds after their Waikiki hotel shifts end (she's a cook; he's a bellman). "We go like menehunes late at night," Donna says. 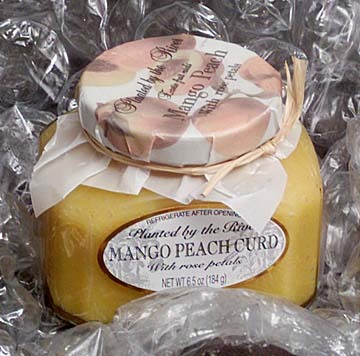 Their unique blends of island fruits -- produced with the help of relatives who pack the jars -- include mango-peach, kiwi-lilikoi and the two latest, pineapple-lemon and raspberry-panini (prickly pear). They sell for $7 to $9 a jar at R. Field Wine Co., Pat's Island Delights, the Tea Chest, Neiman Marcus, Native Books & Beautiful Things and Compleat Kitchen. The Nakamotos will be at the Aliiolani Elementary and Moanalua High School craft fairs Dec. 14. Be sure to mail packed in bubble wrap, although Donna says "the bottle is really strong." OLD FRIENDS, NEW WAYS: 80-year-old Diamond Foods has been producing a basic line of crackers and cookies for decades, with little change in repertoire. But this year the company introduced several new items, including coconut and ginger variations on the standard Diamond Creme and a graham cracker topped with crunchy Maui sugar crystals. President Brent Kunimoto says he now hopes to introduce new products yearly. "It's good comfort food for those who can't come home." 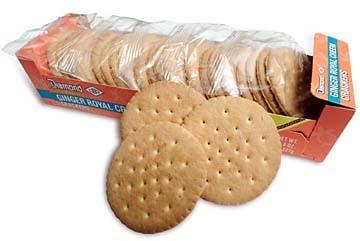 The crackers are widely available for about $2.50, each box including several individually wrapped packages of crackers, making them particularly secure for mailing. CRUNCHY STUFF: Jimmy Chan started frying sweet-potato chips at home three years ago, hoping to serve them on the side when he opened a sandwich shop. 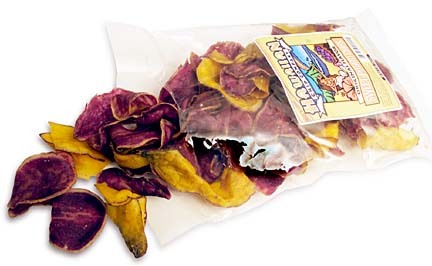 The chips took on a popularity of their own, though, and now his Hawaiian Chip Co. offers a full line: purple and orange sweet potato, taro and Yukon Gold potatoes in various combinations. Flavors range from sweet to garlicky to Spicy Kilauea Fire. Find them from $3 to $4 a bag at gift shops such as Native Books & Beautiful Things and Pat's Island Delights or through the company's storefront, 717 N. King St. Call 845-9868 or visit the Web site, www.hawaiianchipcompany.com, for a list of all outlets. Coming next: wasabi flavor. ORGANIC BREW: Lion Coffee's organic coffee beans are stored in a separate corner of the Kalihi factory and processed on specially cleaned equipment. Beans are certified organic and those that come from South America or Mexico are pre-roasted so they won't have to be fumigated once they get here. Jim Waymon, president of Lion Coffee, said he waited until federal organic regulations took effect this summer, to be sure that competitors would have to meet the same standards, which can be costly. 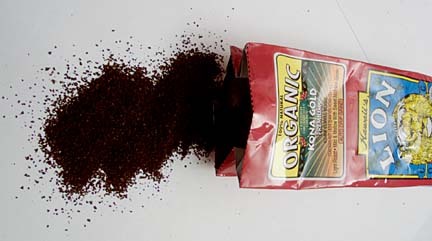 The organic Kona line includes light and dark roasts and a vanilla-mac-nut flavor. 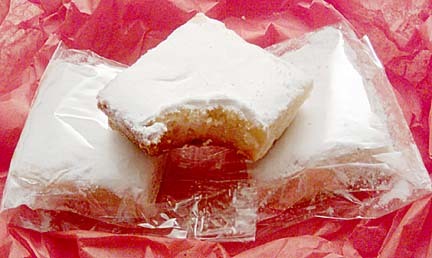 They are widely available at various prices, as low as $3.99 when they're the loss-leader at Long's Drug Stores. LEMON LUXURY: Sara Ouchi gave up her job as a legal secretary to get into baking full time, after her first customers convinced her there was a future in her homemade lemon bars. Her one-woman company, Cookie Basket, now produces 350 bags daily, in flavors such as a luscious lilikoi-lemon with a mac-nut shortbread crust. Each of the 12 bars in a bag is individually wrapped. Her newest flavor is lilikoi-chocolate on a chocolate-chip crust. Find them for $6 to $7 at Petals and Beans, Baldwin's Sweet Shop, Samurai Candy at Pioneer Plaza and Pat's Island Delights. 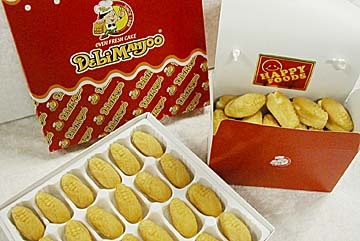 Happy Foods' new Deli Manjoo cakes resemble little ears of corn. 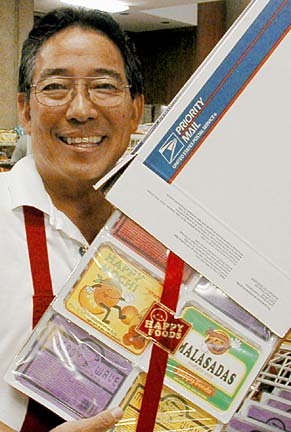 MOCHI AND BEYOND: Roy and Kathy Nakashima of Happy Foods put out the kind of products that bring smiles. They started with microwave mochi mixes, recently adding malassada, andagi and poi mochi mixes. Great for mailing, they come in tofu-type tubs and six fit perfectly into a priority mailer box (free from the post office; about $10 to mail). A prepackaged Survival Pack is $18, or mix and match your own for $3 each. The couple's newest treat is Deli Manjoo, a tiny cake with a choice of seven cream fillings (freeze to mail). Six pieces cost $2, and they're available in gift boxes. Happy Foods is in Pioneer Plaza, or you can find the Nakashimas at craft fairs -- Dec. 14 at Aliiolani Elementary in Kaimuki. Call 383-4196.